Overlooking the port of Naxos, this is one of the oldest and most famous bars in town. 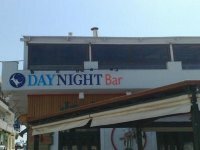 Playing mainly Greek music, Day Night is the best place to end your night. You can enjoy your drink or cocktail with a really great view of the port road and even the Apollo's Temple (Portara).